Regarded by many as the finest fighter produced by the Italians during WWII, the G.55 has not been that well represented in kits. Though I'm sure I'll miss a few, the ones I can remember are the Frog and Supermodel versions in 1/72 and the SMER 1/50 kit. The only really good one in 1/48 has been by Classic Airframes. Though I've seen it built a couple of times, for some reason Italian planes don't get the table time at contests as they should. I figure it is the difficulty in doing the camo schemes that scares many away. Truly, the majority of them are not for those without some skill with an airbrush. Despite the only really good kit being a short run version, Aeromaster decided to take a chance on things and produce a sheet for them. 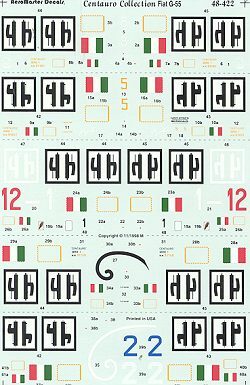 This particular sheet covers five aircraft, nearly all of them having unique camo schemes. All of them are in ANR markings as none of these planes were in operational service prior to the surrender in 1943. 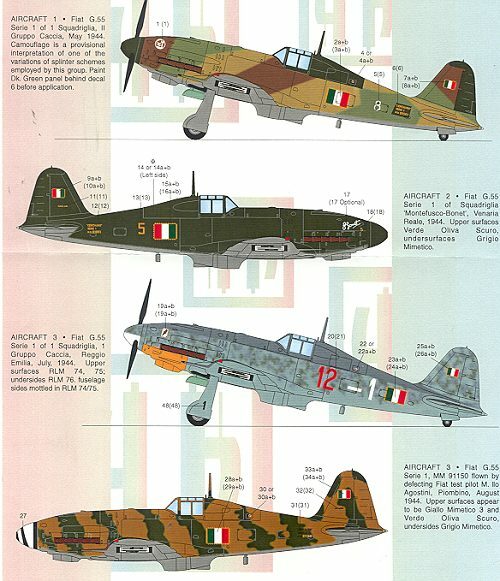 First is nice five color camo'd G.55 of 1 Sq/II Gruppo in May of 1944 with a typical splinter pattern used by this unit. Next is an easy to paint Green over grey scheme for this early G.55 from Squadriglia 'Montelusco-Bonet' in 1944. In RLM colors of 74/75/76 is red 12 from 1 Sq/1 Gruppo. This one has a yellow undercowl. The next plane was flown by a defecting test pilot so no unit codes were applied. It is in a very nice brown/green over grey camo scheme. Finally, another dark green over grey aircraft of the commander of II Gruppo. Blue 2 has a replacement panel that is either in faded green or primer. If the kit decals are not to your liking, then this sheet would be a good choice (if you can find one). If you are looking for a good reference on this plane, then I can recommend Aviolibri #3 as it gives good coverage of the plane.